Our reasons for shunning southern exposures are mostly aesthetic, but a recent article in the Tokyo Shimbun suggests that maybe southern exposures are not economical or even healthy. The University of Tokyo Engineering Department built an experimental house on the roof of one of its buildings to study the effect of direct sunlight on interior environments. Like almost all modern Japanese housing, the part of the building facing south had large plate glass windows so as to allow more light in. On sunny winter days when the exterior temperature was 10 degrees C, the interior temperature was as much as 35 degrees C, which is actually bad for the people who live there. In essence, the large windows make it difficult to control the interior temperature, which means the home owner may actually use more energy. According to the professor in charge of the project, it depends on the type of glass that is used, but in most houses the windows allow visible and near infrared light to pass into the house, where it is reflected off of the floor in the form of far infrared light, warming the room. Far infrared light cannot pass back out the window and thus more heat is trapped in the room. Direct sunlight contains a great deal of energy. Moreover, at night, when temperatures drop even further and there is no sunlight, more heat escapes from the house because of these big windows. The experiment was mainly carried out to study the effectiveness of large windows, but what we took away from the article was that the merit of a southern exposure is a myth. 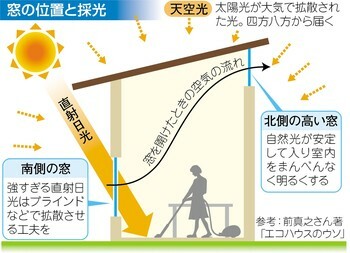 The professor said that the kind of direct sunlight that enters the house through these large windows is also bad for the eyes, since it is incredibly bright. Inside, there will be areas of high contrast, and the pupils of the eye will adjust in reference to the brightest areas, thus making other areas too dark to see. Tasks such as reading or watching TV strain the eyes when there is too much direct sunlight. The professor suggests smaller windows that are positioned in such a way as to take advantage of “scattered light,” meaning atmospheric light that is indirect but still bright enough to illuminate the interior without the need for artificial lighting. He even said the windows can be put on the north side of the house since scattered light does not diminish depending on the direction. We can testify to this finding since our last apartment was on the northwest corner of the building, meaning we got very little direct sunlight. However we received plenty of indirect light and never had to turn on any lamps in the daytime anywhere in the apartment. And because our orientation was unpopular, we actually paid less rent than people who rented apartments on the south and east sides of the building. So the next time we meet a builder or developer who snorts at our desire for a northern or western exposure, we’ll cite the University of Tokyo study, though we’re pretty sure it won’t make a difference. In addition, if you are going to build a house with a southern exposure, you build a deep overhang: lots of winter sun, and little summer sun. Much as I loathe Japanese housing stock, it’s not getting done in N. America either. I haven’t noticed this to be necessarily true. What is true is that all dwellings try to have a balcony with a southern exposure for laundry drying, which seems like a good idea to me. I’m sure the resale value (and initial saleability for spec homes) would be negatively effected if this were not done. This kind of thing is true everywhere. In the United States, for instance, now you can’t really get a tract home without a “great room/kitchen/dining” layout, even though it increases the cost of heating/cooling and you can forget about doing any frying or anything that produces smoke in the kitchen. But this is the fashion, and you need to build home for the 80 percent, who even if they don’t personally want it, will desire it for resale value. By the way, I think your Japan housing book would fine a good market if you could ever finish it. Are you perfectionists? Any research you’ve done has a shelf life, and you need to either publish it or start over again as it gets outdated. What people actually want is just insolation, which is not a given in the built-up areas, and in condo blocks with both N and S facing units. For SFHs, rooftop PV also adds some complication here. southern exposure is essential in the northern hemisphere – especially in Japan, who of late is having issues providing sufficient electricity for heating/cooling and lighting (Fukushima etc.). as the first respondent commented, you need to provide sufficient shade from direct sunlight in the summer but for the overhang (eaves) is short enough (taken perpendicular off of the vertical face of the building) to allow sufficient direct sunlight during winter. this can at times be difficult to do, however, a well qualified architect can certainly design a home to include this most important and basic aspect of good design. it is also advisable to provide windows to important views (passive and active) to ensure the concept of the home/building is maintained and strengthened. placing windows only on the northern side will ensure you will be turning on lights day and night and require considerable heating in winter. very unsustainable and irresponsible. we now know better than 50yrs ago and should use this knowledge to design homes/buildings that use less energy and provide a better overal level of comfort for the occupants. unfortunately project home builders and draftspersons often are not trained to fully understand the critical concept of correct orientation – hence why the housing stock at times is so very inefficient. I do hope this will change in the future. As far as I am concerned getting as much sunshine in the house (or most of the house) is essential for mental well being.There is nothing worse than a cool,dark home. These are the places you store aples or potatoes! Summer is short enough and strong rays can be controlled with a bamboo blind, a nice noren hung from the eaves, or curtains if you like. ‘Scattered light’ sounds like a complete nonsense/fad/BS you see in some modern plastic houses. I suppose people who choose to live in a plastic house dont care about a view anyway. They certainly dont use the sun to dry vegetables and fruits for vitamin supplementst/drying etc or air futons, al fresco dining, sunset gazing or whatever. I hope they are happy with their plastic which has its own health problems (low sperm count for one) and zero aesthetics. I would go for sky lights on the north side and solar on the south/west. Insulate the rest and fit some glass if you must. However if you have a woodstove and or a hibachi you should have as many nice drafts (ventilation) as possible…or sit in your insualtion box and get your fill of all denka. (Mmmm… idiots). As for the bright light being bad for eyes, that is what sunglasses were invented for. People shouldn’t watch TV during the day-what a waste of time anyway. I bet watching TV is worse for your eyes than many outdoor activities (to say nothing of your brain). Perhaps the best shape for a house is a triangle or diamond, with the front door your narrowest point in the north? Haha.